Overlooking historic Leith Links Park, this elegant Victorian 4-star guest house is 10 minutes from Edinburgh city centre. Offering free parking, a free drink on arrival and rooms with iPod docks, Sandaig has good access to a regular bus service. The family-run Seawold Guest House in Jersey is ideally situated on the Island's south coast between St Helier and St Aubin - the perfect base for a Jersey holiday. The sandy beach of St Aubin's Bay is just across the road from Seawold Guest House and ideal for swimming and water sports. Seawold Guest House in Jersey is on the main bus route and there is limited car parking at the guest house. This eco-friendly property overlooks the Atlantic Ocean and offers an escape from technology. The hotel features massage services and studios with outdoor patios equipped with hammocks and chairs. Beechfield Guesthouse is located in Ballymena, County Antrim, just a 2-minute walk from the local train and bus station. It offers rooms with free Wi-Fi, breakfasts and free parking. Rooms at Beechfield have bathrooms with showers and baths. Hermitage is a quiet guest house overlooking Leith Links Park, and 1.5 miles (2.4 km) northeast of Edinburgh city centre and Princes Street. 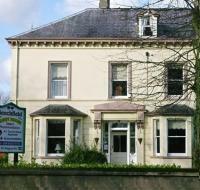 Hermitage Guest House has street parking and is a 10-minute bus journey from the city centre. This elegant 18th-century Victorian town house is walking distance from Holyrood Park and offers free car parking and homemade meals on request.